Paced at warp speed with spectacular action sequences rendered brilliantly and with a cast so expert that all the familiar characters are instantly identifiable, the film gives Paramount Pictures a new lease of life on its franchise. Fans of the “Star Trek” saga will be delighted to see Capt. 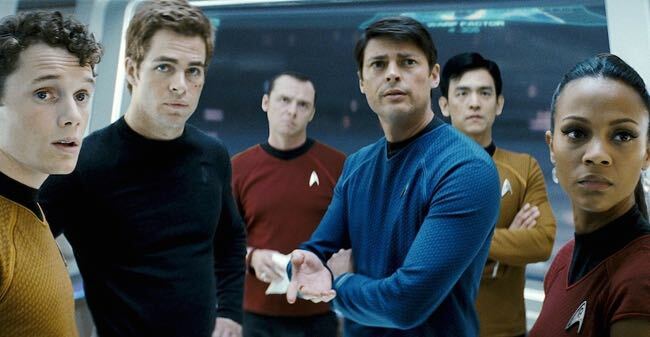 Kirk (Chris Pine), Spock (Zachary Quinto), Bones (Karl Urban) and all the others in the early part of their lives as the Starship Enterprise takes its maiden voyage. The film is so much fun, however, that it will draw in moviegoers just looking for a sensational ride. The boxoffice should beam up enormous returns. Abrams and screenwriters Roberto Orci & Alex Kurtzman keep the plot simple but hit all the right notes and some phrases that will bring a smile of recognition. Industrial Light + Magic once again raises the bar on special effects, and Daniel Mindel’s cinematography and Scott Chambliss’ production design are top-notch. In a breathtaking precredit sequence, James T. Kirk is shown as he is born while his Starship captain father (Chris Hemsworth) goes to his death in a blaze of glory. The film sketches the different childhoods of Kirk and his future partner Spock, then moves quickly to their time at the Starfleet Academy before they are ordered to go on a rescue mission to the planet Vulcan. Their leader, Capt. Christopher Pike (Bruce Greenwood), ends up being taken prisoner by a Romulan named Nero (Eric Bana), who is bent on destroying all the planets in the federation including Earth. The remainder of the film shows Kirk and Spock out to rescue Pike and save the world. One of the great charms of the film is that anyone who knows anything about the original “Star Trek” crew will be right at home with the new cast. Pine has Kirk’s good looks and brash confidence. 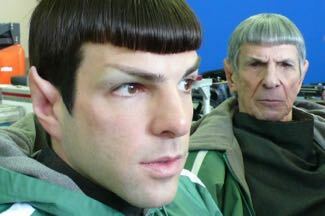 Quinto (from NBC’s “Heroes”) is an uncanny Spock and holds his own even when confronted by the original in the form of Leonard Nimoy (pictured left). Urban as Dr. McCoy, John Cho as Sulu and Anton Yelchin as Chekov all get moments to shine, while, as the glamorous Uhura, Zoe Saldana has fun in discovering an unlikely romantic partner. Simon Pegg shows up as engineer Scotty about 80 minutes into the picture but makes the most of his limited time. Bana is almost unrecognizable as the villain Nero, but he makes the role suitably scary. The ever-stately Nimoy has much more to do than a mere cameo although you’ll miss Winona Ryder if you blink. One slight disappointment is the score by Abrams regular Michael Giacchino, which though given prominence in the sound mix is derivative and includes Alexander Courage’s original theme only at the end. Opens: May 8 (Paramount Poctures); Cast: Chris Pine, Zachary Quinto, Leonard Nimoy, Anton Yelchin, Zoe Saldana, Karl Urban, John Cho, Simon Pegg, Eric Bana, Clifton Collins Jr., Winona Ryder, Ben Cross, Bruce Greenwood; Director, producer: J.J. Abrams; Writers: Alex Kurtzman, Roberto Orci; Director of Photography: Daniel Mindel; Production Designer: Scott Chambliss; Music: Michael Giacchino; Editors: Mary Jo Markey, Maryann Brandon; Costume Designer: Michael Kaplan; Producer: Damon Lindelof; Executive Producers: Alex Kurtzman, Roberto Orci; Bryan Burk, Jeffrey Chernov; Production: Bad Robot, Mavrocine; Rate PG-13; Running time, 127 minutes. This entry was posted in Film, Reviews and tagged 'Star Trek'. J.J. Abrams, Anton Yelchin, Chris Pine, Karl Urban, Leonard Nimoy, Michael Giacchino, Paramount Pictures, Simon Pegg, Winona Ryder, Zachary Quinto, Zoe Saldana. Bookmark the permalink.